This delicious oatmeal recipe has so many variations, it can easily be served several days each week without repeats! Cook it while you are getting ready, then enjoy this hot breakfast to fuel the rest of your morning! You can begin the soaking process the night before to save yourself time in the morning. Place the dates and 3 cups hot water in a medium saucepan; allow to sit for at least 15 minutes. If you buy whole rather than chopped dates, chop them finely yourself before measuring. In a small bowl, add chia and flax to 1/2 cup of water; set aside. Shred the apples; add to saucepan with water and dates. Granny Smith or any baking apple is ideal. However, just about any apple will work. Consider shredding two with very different flavors for a change of pace. Begin toasting almonds, coconut or other desired toppings. Remember to check on them throughout the process. Pour the rolled oats into the saucepan. Quick cooking oats will not quickly become mushy. Add 2 T. cinnamon and 2 pinches of sea salt or to taste. Make sure to use high-quality salt with visible minerals rather than cheap iodized salt. Substitute ground nutmeg or clove for all or part of the cinnamon if desired, or omit entirely if you prefer a blander diet. Place saucepan on medium burner. Stir every minute or two until it becomes bubbly. Then, reduce the heat to low and cover the saucepan. Stir in a few minutes to ensure that the heat is high enough to cook the food without scorching the bottom. Continue stirring every 10 minutes, until mixture is at the desired consistency, usually 20-30 minutes. You can add more water for a thinner oatmeal. Remove from heat and set aside for five minutes to cool. Add the flax and chia mixture to the oats, stirring thoroughly. 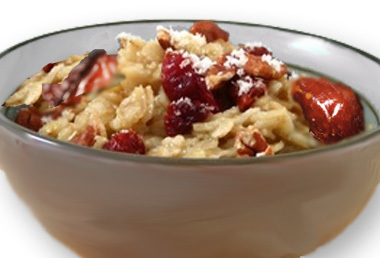 You are then ready to serve this delicious oatmeal. This is a great dish for 2-4 people, depending upon the size of the servings. 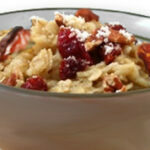 You and your family are sure to enjoy the combinations possible with this highly nutritious oatmeal. It has plenty of fiber to keep your digestive tract functioning well and a balance of slower and faster-burning carbs to keep you energized all morning! Jonathan Leger is a freelance writer and small business owner. He runs a popular question and answer website at AnswerThis.co.